What does Mark Zuckerberg have against the fashion industry? The technology sector offers great assistance to the garment industry in numerous ways. Smart fabrics, wearable technology, CAD software, etc., provide amazing benefits to our industry. However, we are concerned that technology leaders such as Mark Zuckerberg and even the late Steve Jobs, have taken steps that endanger the existence of the garment industry. Facebook CEO Mark Zuckerberg said in an interview back in October 2012 on "NBC's Today" stating that he lives a "simple" life and proudly wears the same thing every day. Zuckerberg confessed to host Matt Lauer that he owns "maybe about 20″ identical gray t-shirts (that was back in 2012). Is wearing the same clothes every day good or bad for the fashion industry? Well, although the variety of clothing would be greatly reduced and the number of companies needed would clearly reduce, the clothing that we own would continue to age & wear out. Therefore, new clothes would always need to be purchased on a regular basis. Granted, it would be the same clothing over and over, but at least new clothing would need to be bought. Fortunately, if clothing needs to be purchased, the apparel industry would exist. HOWEVER, our industry certainly would not be robust or look anything like it does today. It would be a horribly drab and a sickly version of what we all currently enjoy. If we all wore grey t-shirts or black turtle necks & jeans day after day, there would be no need for merchandisers, fashion designers, illustrators, stylists, pattern makers, etc. Fashion magazines, boutiques, photographers, bloggers, and many other creative aspects of the garment industry would begin to wither on the vine. The clothing industry would be made up of super large scale factories churning out product in an extremely efficient manner, but in this case efficiency would not be welcome. Most of the smaller factories will disappear from the landscape. Sewers that had been required for intricate design work will be replaced with robotics capable of sewing boring straight lines. Minimal staff would be required as garment printing and embroidery facilities would become obsolete. Embellishment would be a thing of the past. Far few stores would be needed, possibly no stores at all (Amazon's dream come true). It is understood that some educational institutions require a dress code to maintain uniformity and simplicity. Fortunately, after school hours and when young students graduate they can explore the world of fashion and let the creative machine continue to churn. School uniforms does not affect the industry in the same manner that a full scale Mark Zuckerberg shirt trend would affect the world. 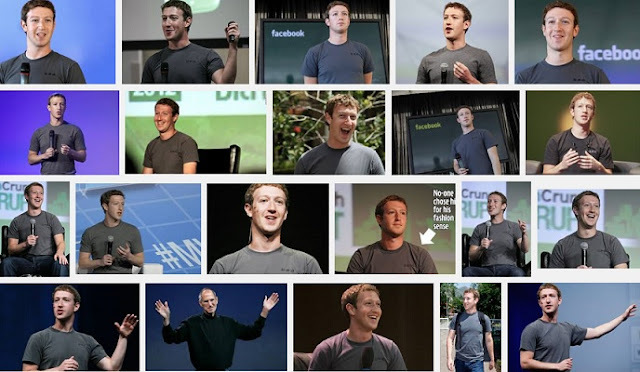 If more people follow the Mark Zuckerberg grey t-shirt trend, the fashion industry may be jeopardized. Other notables known to wear the same thing on a regular basis would be Steve Jobs and Albert Einstein. Is this trend crazy, or is the concept something that makes complete sense. Some people may think that rather than concentrate on what one needs to wear, possibly we can focus on more important aspects of our lives. Unfortunately, those people are not considering the harm to the fashion industry. Please don’t wear the same clothes every day. Even if you are washing before wearing, it is not healthy for the apparel industry or the financial well-being of the world economy. Change your clothes, and support the stability of the world economy. Is Mark Zuckerberg inadvertently harming the fashion industry? Learn about some of the positive ways that technology is helping the fashion industry. What do you think about Mark Zuckerberg wearing grey shirts every day? Aside, from what I mention above, I actually think it makes sense... (don't tell anyone that I said that).